“Some of the earliest birding experiences I can recall involved the nostalgic Killdeer. Its plaintive cry – repeating its name over and over again – is such a familiar, unmistakable and welcome sound for me. “I recall, as a young birder, being taken by the broken-wing act to protect the nest and, although I knew this behaviour was instinctive, it somehow seemed to be a well-thought-out plan. I remember thinking that I had outsmarted them when I finally learned that the nest was in the opposite direction to the one I was being led in. “Nest is a little too expansive a word for several eggs simply laid in an open gravel lot, but differentiating eggs from gravel was a far more difficult task than I thought it would be as I stepped very slowly and carefully to avoid crushing them. And all the while the adult was running in that peculiar gait, dragging one wing and exposing the rusty rump to try and draw my attention. Not surprisingly, given my father’s obvious affection for it, the familiar Killdeer is one of the earliest birds I can recall forming a connection to. I’d say without hesitation that I recognized a Killdeer before I recognized some of my own relatives. It has been in my life for so long, in fact, that I never once stopped to consider how strange its name was. Then a few weeks ago I pointed one out to a person who’d never seen one before, and she gave me the darndest look when I told her what it was called. I had to step back and consider that it is indeed odd to give this innocuous little bird a name that suggests it’s hunting far above its weight class. The dainty Killdeer does nothing of the sort. 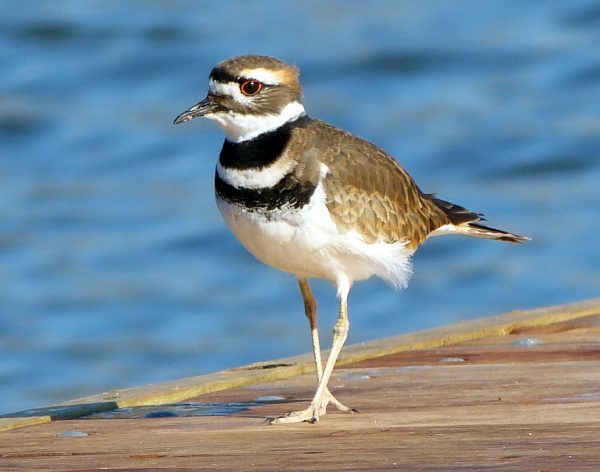 I explained that the name Killdeer is an onomatopoetic reference to the bird’s distinctive call1, but upon further consideration I realized that not only is “kill deer” a strange thing for a bird to say, but you also really need to use your imagination to hear it. I don’t know who originally decided on the unusual name2 but it has stuck over the years, even in the face of alternative and suitable suggestions like Noisy Plover and Chattering Plover. In case you’re not picking up on the theme here, these little birds are loud! Their nervous screams and cries can be heard at great distance, and the word “incessant” could have been invented specifically for them. If you’re seeing but not hearing a Killdeer, it’s probably dead. Whether or not you’re familiar with the Killdeer, chances are good that if you live in North America, you’ve seen (or heard) one before. These birds belong in the shorebird group and do like the shore, but are also quite at home in a farm field, parking lot, roadside, golf course, urban park, or the vacant lot next door. Any open habitat whatsoever could be the site of a Killdeer nest, so if you have even a fleeting awareness of them, you’re bound to run across one sooner or later. It is probably the Killdeer’s status as a familiar neighbour that has allowed it to keep its one-word name, as it is not physically very distinct from many of the other plovers. It is about the size of a dove, with a similarly chunky body but longer legs. Its back is brown, its belly is white, and it sports two concentric, black collars that wrap around its breast. Its stout black bill – characteristic of most plovers – allows it to grab all manner of invertebrate prey on dry land or in shallow water. The Killdeer’s most colourful feature is exposed only when it flies or when it defends its nest, the latter of which it does with great spectacle. If a predator3 approaches its eggs or chicks (both of which are stealthily camouflaged), the Killdeer initiates an elaborate act. Hanging one wing to the ground as though it were broken, the Killdeer exposes its Creamsicle-orange rump and screams bloody-murder, drawing the animal’s attention and slowly leading it away from the concealed young toward the promise of an easy meal. When the bird figures the predator is far enough afield, it simply picks up its lame wing, launches into the air, goes momentarily (and uncharacteristically) silent, and returns to rejoin its family. The broken-wing act in action. If you were a hungry fox, you’d be all over this. I have argued before that charismatic, one-word names can help capture people’s imaginations, and I think that goes doubly for children. With indoor recreation and “nature deficit disorder” becoming the norm, it is now more important than ever to give kids the opportunity to connect with the natural world. Birds – with their bright colours, loud noises, ubiquitous presence and unusual behaviours – are a perfect tool with which to do that. But with a thousand things vying for children’s attention these days, it’s tough to grab a 10-year-old’s focus with something as drab-sounding as a Clay-colored Sparrow or Black-and-White Warbler – they’ll hardly look up from their Gamebox or Playcube. Whenever possible, we need to be able to captivate kids with a single word. Maybe if every child had a relationship with their neighbourhood Killdeer like I did, and my father before me, we could open the doors to the out-of-doors for an entire generation. 1I didn’t actually use the word “onomatopoetic” because, you know, that would be weird. 2Nor, apparently, does Google, although it seems to have arisen in the 18th century.